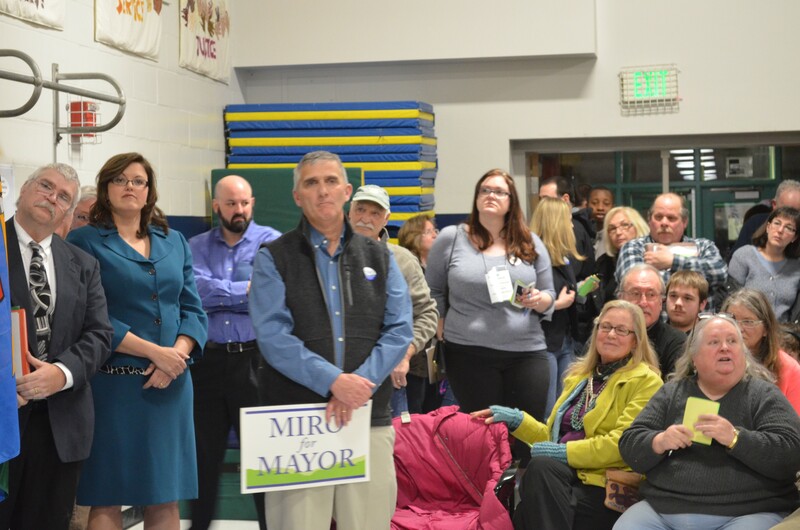 The logjam at the entryway to the Burlington Democrats’ caucus on Sunday evening was evidence that there would be competition inside. Unlike three years ago, it was not caused by the mayor's race. 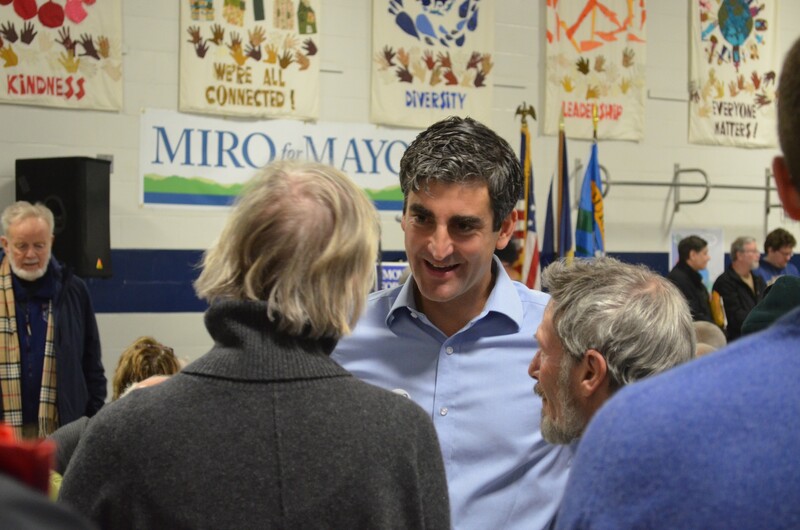 The party was the picture of unity when members unanimously voted to back Miro Weinberger, who’s seeking his second three-year term as mayor. He was nominated by council president Joan Shannon, who lauded him for governing "inclusively" and listening to people of all political stripes, and by former governor Madeline Kunin, who described him as a "visionary leader" who "got our fiscal house in order." Weinberger devoted the first six minutes of his 20-minute speech to thanking various supporters and official figures. Then he laid out his case for reelection, suggesting that his challenger, Progressive Steve Goodkind, would cause the city to regress. "Voters on March 3rd will have a very clear choice on the mayoral ballot," Weinberger said. "One option will be to return us to the organizational culture, the policies and some of the same failed leadership that created the Burlington Telecom lawsuit and some of the other messes that we are just now emerging from. The Democratic Party has just given the people of Burlington the option to keep moving forward." "Keep moving forward," by the way, is his new campaign slogan, replacing "a fresh start," which he promised voters three years ago. After touting his administration's progress improving the city's finances and its infrastructure, Weinberger outlined five priorities for a second term: creating jobs, building a more livable and walkable city, achieving municipal savings and efficiencies, making government more effective, and making the city more inclusive. As for specific plans to make those things happen, Weinberger said he'll ask the city council this Monday to put a "major new economic development initiative" on the Town Meeting Day ballot. It would use tax-increment financing to improve street trees, sidewalks and other public infrastructure. 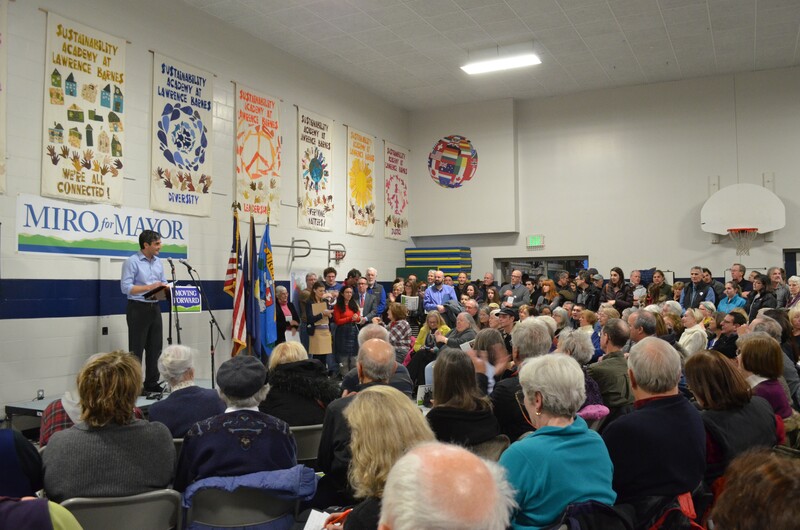 He also told the crowd to stay tuned for a 10-year capital plan and an ambitious early learning initiative to provide more access to child care. This year's easy ride for Weinberger was markedly different from the situation he faced three years ago. Then, caucus-goers departed when, after three rounds of voting, he and Sen. Tim Ashe (D/P-Chittenden) finished in a dead tie. Weinberger later won in a runoff. When it came to picking city council candidates in the New North End, there was more contention. Democrats passed over one of their sitting councilors, Dave Hartnett, instead endorsing Carmen George, a former city councilor. A two-term, moderate Democrat, Hartnett stood at the door as people filed into the Sustainability Academy gym. Before the vote, though, George reminded people that during the mayoral election three years ago, Hartnett backed his longtime friend and political ally Republican Kurt Wright over Weinberger. She told that crowd, pointedly, that "I come from the Democratic wing of the Democratic party." An audience member interrupted and accused her of being a Progressive. George received 72 votes to Hartnett's 53. In an interview after the caucus, Hartnett said he'll consider running for the North district seat as an independent, but despite the rebuke, he's reluctant to part ways with the Democratic Party. Though he's now a firm supporter of Weinberger, Hartnett said he doesn't regret backing Wright. "Occasionally I will stray from the party and will support a candidate who I think is impressive. I’m not going to shy away from that." Despite that, he continued, "I firmly believe I have more Democratic values than some of the Democratic councilors ... I don’t know if there has been a better councilor who’s served the working class of Burlington." Ward 7 also featured a close race. Tom Ayres, who is finishing his first term on the council, prevailed over Jason L’Ecuyer by seven votes. In other wards and districts, endorsements were less eventful. Democrats picked up several additional candidates since Seven Days last reported on the races, and they now have nearly a full roster. Endorsements are listed below. Progressives have also gained another candidate, bringing their count to five: Michael Fife, who’s running against Mason in Ward 5. And Ron Ruloff, an independent, has informed Seven Days that he plans to run for council in the Central District. Correction 1/12/2015: Tom Ayres is completing his first term on the city council — not his second, as originally reported.